March excites me because Spring will be here soon! But first, we have St. Patrick's Day. I'm not Irish but I love the whole fun of this traditional holiday. 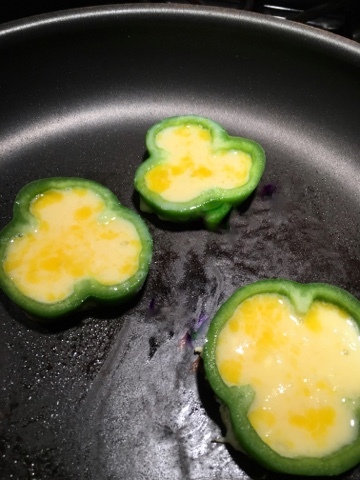 I made some Shamrock eggs to share with you. These would make a great breakfast on St. Patrick's Day. I'm actually eating them today because I traditionally eat a bowl of Lucky Charms on St. Patrick's Day morning. We will then do a corn beef brisket and cabbage for that afternoon. In-between that, Ill be working. 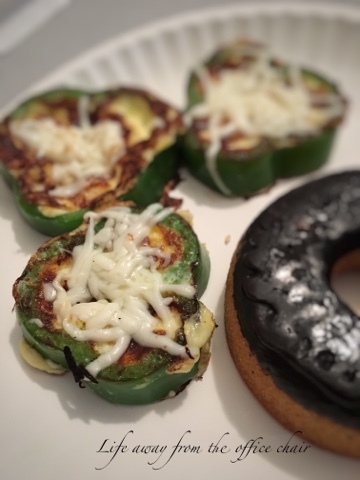 The way I did these little clover eggs is, I cut a bell pepper in rings, just straight through. They come out in the shape of shamrocks. Cook huh? Then I placed them in a greased frying pan and let them cook some while I whipped up me egg. Then I poured the egg into the pepper ring. I let it continue to cook at this point. When I figured the egg was done halfway through, I flipped the pepper to cook on the other side. Yes, the eggs leek into the pan a bit but thats fine. 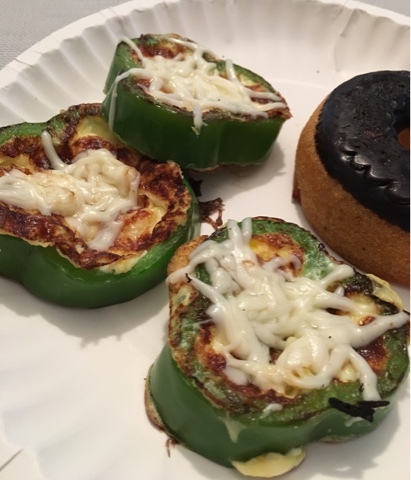 Top with some cheese and you have a healthy breakfast with a serving of vegetables. Pictured with the Nutrisystem chocolate frosted doughnut. I enjoyed these! I will do this more often. They were full of flavor! This weekend I will add some green decorations to the house and find me a green shirt. Now if I can just get some green in my pockets! Well I never! What a great idea, Imma do that when we get a bell pepper, St. Patty's or not. I seldom eat eggs, but I had two for supper last night. Now I want to eat some pretty ones. THANKS for a neat idea. U B Full of 'em! Wow, love that idea. I will certainly give it a try. Lisa, You have some of the greatest ideas about everything. I enjoy your posts. I'm going to "fix me some shamrock eggs." Happy day to you. Wow what a cute recipe to make eggs this way! Thanks for this great idea! Hope you have a wonderful day and week.